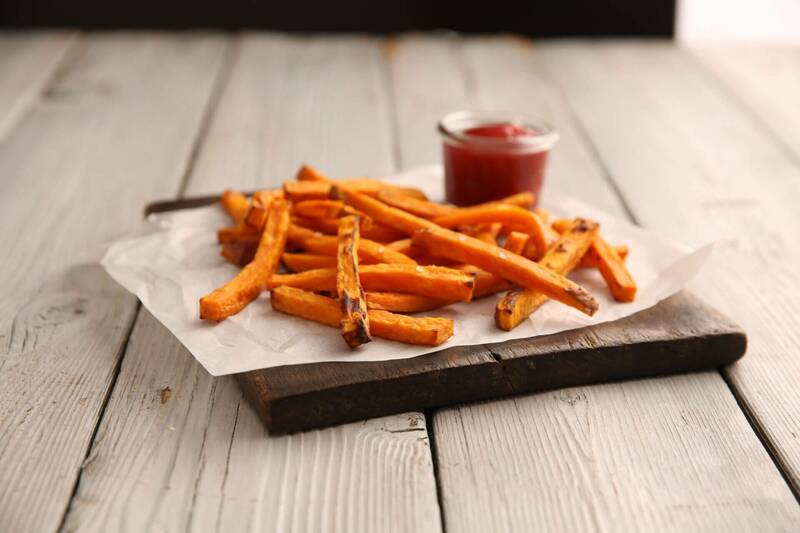 When it comes to sweet potato fries, crispy perfection is what we strive for! Don’t worry, our extra crispy sweet potato fries do not require buckets of oil or deep-frying. In fact, these crunchy bites of heaven are baked. Oh yes, dive deep into a hot, crispy batch without an ounce of guilt. Enjoy as a side dish, with your favorite dipping sauce or alone in their simple deliciousness. What’s our favorite way to make them? In a big batch with multiple dipping sauces – it’s a fun, interactive party snack that the whole crowd will love. Preheat oven to 400°F. Line 2 baking sheets with foil; spray with nonstick cooking spray. For crisper results, place a metal rack on each baking sheet. Spread sweet potatoes in a single layer on racks or foil without crowding; set aside remaining sweet potatoes.